HJRCA 8 (Mitchell) is a proposed constitutional amendment that would amend the Illinois Constitution to authorize the imposition of a graduated income tax. This proposal was also introduced last year and never made it out of Rules committee, but was recently assigned to the House Revenue committee and to the Income tax subcommittee of the Revenue committee. Amendment 1 to SB 2367 (Stadelman) would amend the Property Tax Code to modify the assessment procedures for certain “big box” stores defined as “limited market or special purpose property”. SB 2921 (Hutchinson-Althoff) is an initiative of the Illinois Chamber’s Tax Institute. This bill amends the Uniform Penalty and Interest Act to provide for automatic abatement of the underpayment penalty when a taxpayer has been determined upon audit to have paid at least 95% of the taxes due. The bill also caps the underpayment penalty at 15% and eliminates the provisions in the current law that impose a 20% penalty on any underpayments paid after commencement of an audit unless the audit results are agreed to by the taxpayer. SB 2148 (Hutchinson) would amend the Illinois Income Tax Act to decouple from IRC Section 199 – the Domestic Production Activities Deduction, requires an addback of the foreign and domestic dividend subtractions, and repeals the unitary business group “non-combination” rule. The Illinois Chamber is strongly opposed. There are several measures before the Senate Revenue Committee that would amend the Retailers’ Occupation Tax Act to allow the sharing of certain taxpayer information by the Department of Revenue with municipalities and counties. Among the bills scheduled for consideration were SB 2562, SB 2933, and SB 3295. SB 2933, would allow the sharing of such information by the municipalities with third parties. The Chamber opposes the sharing of tax information with third parties. It is the Chamber’s understanding that the Senate Revenue Committee may hold a subject matter hearing in April to discuss the topic of sharing taxpayer’s information with other units of government. SB 2506 (Righter) is an initiative of the Illinois Chamber. This would require the Department of Human Rights to close its investigation if the charge filed with IDHR is based on a litigated discrimination violation that is identical to a charge filed with a local government unit or the federal EEOC and such protection also is provided by the other governmental body. SB 2613 (Bertino-Tarrant) would mandate four weeks for child bereavement. SB 3097 (Collins) and HB 6162 (Skoog) would require employers to allow employees to use personal sick leave benefits provided by the employer for absences due to an illness, injury, or medical appointment of the employee’s child, spouse, sibling, parent, mother-in-law, father-in-law, grandchild, grandparent, or stepparent on the same terms upon which the employee is able to use sick leave benefits for the employee’s own illness or injury. SB 2147 (Hutchinson) would create the Healthy Workplace Act and require employers to provide seven paid sick days to employees. HB 4999 (Rep. Guzzardi) amends the Right to Privacy in the Workplace Act making it unlawful for an employer or prospective employer to request or require an employee or applicant to authenticate or access a personal online account in the presence of the employer; to request or require that an employee or applicant invite the employer to join a group affiliated with any personal online account of the employee or applicant; or join an online account established by the employer. It prohibits retaliation against an employee or applicant. An amendment is being prepared to address concerns. HB 5533 (Rep. Morrison) creates the Limitations on Actions for Negligent Hiring Act limiting a cause of action brought against a party solely for hiring an employee or independent contractor who has been convicted of a nonviolent, non-sexual offense. HB 3297 (Mitchell) would create the Employee Paid Health Care Time Act and would employees to accrue paid health care time at a rate of no less than one hour for every 22 hours worked for an employer with 50 or more employees and at a rate of one hour for every 40 hours worked for an employer with fewer than 50 employees. HJRCA 36 is a lockbox amendment. This constitutional amendment would end Road Fund diversions by preventing any money from being removed from the Road Fund for any purpose other than transportation. As a result of this, transportation investment will be predictable, allowing businesses to plan investments long term. HB 3755 (Hoffman) would require rail carriers to operate with a two-man crew. SB 2592 (Althoff and Rep. Munoz) would impose a $3 surcharge in addition to other registration fees for motor vehicles of the first division, motorcycles, motor driven cycles, pedalcycles, and vehicles registered in the 8,000 lb. and less flat weight plate category to be used to help fund the Illinois Emergency Management Agency. HB 6025 (Yingling) amends the Biometric Information Privacy Act to provide that a private entity may not require a person/customer to provide his/her biometric identifier or biometric information as a condition for the provision of goods or services. The bill makes an exception for an employer to conduct background checks or implement employee security protocols. In addition, this provision does not apply to 1) companies that provide medical services, 2) law enforcement agencies or 3) governmental entities. The Public Health committee passed SB 2403 (Rose), as amended, which requires hospitals to adopt and implement evidence based protocols for the early recognition and treatment of patients with sepsis, severe sepsis or septic shock based on generally accepted standards of care. HB 5750 (G. Harris) creates a one percent assessment on health claims paid by a health insurance carrier or third party administrator. HB 5576 (Nekritz) passed out of House Human Services Committee with a vote of 8-6. The bill mandates coverage without cost sharing for all contraceptive drugs, devices, and other products, including voluntary sterilization. Insurance companies must cover a service or item without cost sharing if the attending provider recommends a particular service or item based on a determination of medical necessity. Insurance must pay for up to 12 months of contraception at one time. SB 2403 (Rose) passed as amended out of the Senate Public Health Committee. The bill would require hospitals to adopt and implement evidence based protocols for the early recognition and treatment of patients with sepsis, severe sepsis or septic shock based on generally accepted standards of care. HB 5759 (Hoffman) would require contractors and subcontractors to comply with Responsible Bidder requirements outlined in the Illinois Procurement Code to qualify for public works projects at the local level. In addition, would require contractors and subcontractors to identify and report to the public body in charge the number of hours worked by minorities and females for each craft or type of worker or mechanic needed to execute the contract. Each contractor and subcontractor shall provide this information on a certified payroll report, or on a monthly manpower utilization report. SB 2873 (Rezin) would streamline and update the state procurement process, improve efficiencies and improve vendor communications while putting into place compliance safeguards for vendors. The goal is to improve state-vendor interaction and opportunities while ensure that the state receives the best return on every dollar spent. HB 5526 (Smiddy) would require any person selling meat in Illinois must package the meat with a label indicating the country in which the meat was produced. SB 2138 (Nybo) passed the Senate Judiciary with an agreement to hold the legislation until a new amendment is filed. This bill would create the Snow Removal Service Liability Limitation Act. SB 2887 (Silverstein) is expected to be heard in the Senate Judiciary Committee. It would introduce Vermont’s patent language into current law, even though the existing law was successfully negotiated a few years ago by all sides. HB 4633 (Martwick) was held in the House Consumer Protection Committee. This legislation deals with unclaimed life insurance benefits. SB 2827 (T. Cullerton) passed unanimously out of Senate Commerce and Economic Development this week. This legislation would reduce LLC fees from $750 to $59. SB 3315 (Bennet) would create an Advisory Committee on Workforce Shortages. The committee would be made up of appointed members and would be charged with reviewing and identifying industry and occupations in Illinois where shortages are apparent. House Floor Amendment 1 to HB 1290 (Madigan) would allow an employee a lien right on all property of their employer, including after-acquired property, for the full amount of any wages, penalties, and interest owed to the employee. According to CoreLogic, neighboring states have lower property tax rates than Illinois. The California-based data aggregator generated median property tax burdens, calculated as a percentage of property value, of 1.95% in Wisconsin, 1.69% in Iowa, 1.26% in Missouri, and 0.88% in Indiana. CoreLogic’s data, published this week, agrees with previously public state-by–state surveys by firms such as WalletHub, which have also found Illinois to be one of the worst states in the nation in which to be taxed. Come to the seventh annual Aurora GreenFest on Saturday, June 11 from 10 a.m. to 4 p.m. We will be at Prisco Community Center and McCullough Park at 150 W. Illinois Ave. in Aurora. Volunteers, sponsors and exhibitors can still sign up. Nature exhibits, featuring bats, eagles, bees, skunks and other creatures are center stage this year. Loving nature is one way to teach children and grown-ups to protect the earth. Live music and local food create a festival atmosphere. Green-friendly energy sources show ways to save money and save the world at the same time. · A bike, car and truck show featuring electric vehicles, including a new Tesla, a Nissan Leaf, and a Chevy Volt. · A Kids Eco-village with games, crafts and recycled art projects. Kids teaching kids. Families, educators, and entrepreneurs come every year to the GreenFest to enjoy inspiration, connection, and fun. Last year more than 3,000 people came to the GreenFest. Come and volunteer. Or be a sponsor and partner. We still have a few openings for exhibitors to showcase your wares. Please to visit our website at www.AuroraGreenFest.com. Parents bring your kids. Kids bring your parents. Come to the Aurora GreenFest on June 11th. REGISTRATION IS OPEN! START YOUR TEAM TODAY! JOIN GIGI’S PLAYHOUSE ON SUNDAY JUNE 12! 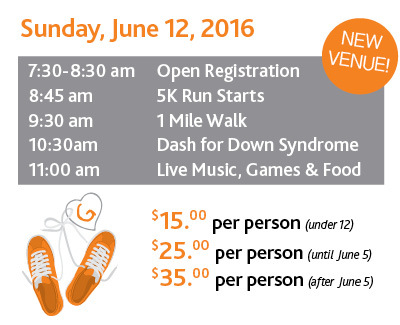 The 2016 GiGi’s Playhouse Chicagoland 5K Fun Run, 1-Mile Inspiration Walk and Dash for Down Syndrome! We run, walk and dash for superstar mentors like Farzin. He recently interviewed for a position at Culver’s and was hired right on the spot! Culver’s ACCEPTS Farzin and believes in his many talents. Farzin is in awesome shape through commitments to exercise and healthy eating that he learned in GiGi University – he even TEACHES ZUMBA to other GiGi U and GiGi Prep participants! Fitness is CRUCIAL for everyone with Down syndrome as it combats low muscle tone and helps build muscles needed for speech, exercise, and working at Culvers! Events like the 5K help promote ACCEPTANCE for our rockstars like Farzin – while raising funds for programs designed to help increase fitness and wellness during the rest of the year. We could not be more proud of Farzin and all of the hard work completed in GiGi U and Hugs & Mugs that prepared him for his great new job. 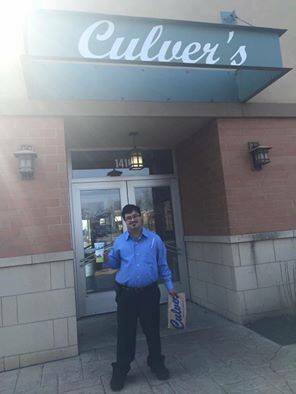 Please join us at the 2016 5K, Walk and Dash to wish Farzin a huge CONGRATS and let’s also thank Culver’s for being generous and kind enough to extend Farzin the opportunity he deserves and has worked so hard to achieve! MB Financial Park is a destination for ultimate fun and experiences for the whole family. 5K event participants and guests of GiGi’s Playhouse will enjoy various post-race amenities at many of these venues and throughout the park itself. Tee Times: 7:30 a.m. and 1:00 p.m. The Fox Valley Park Foundation assists local youth so that all children have the opportunity to experience enrichment programs, sports and camps. Our mission is to make a meaningful difference in children’s lives by providing them the opportunity to participate in Park District programs regardless, of financial position. We open the door to a world of activities that enhance each child’s growth and development. Thank you for your support and contributions to benefit our local youth! Join Metropolitan Coworking for a Ribbon Cutting on Friday, May 6, from 3:30- 5:00 pm with Ribbon Cutting at 4:00 p.m. The grand opening celebration will include refreshments, light snacks and tours of this new shared riverfront office, meeting and event space. Aurora Regional Fire Museum, has hired a new Executive Director. Brian Failing brings nearly 8 years of experience in museums with him to this position. He has worked most recently with the DuPage County Historical Museum, Forest Preserve District of DuPage County and the West Chicago City Museum in Illinois and is the former curator of The Museums at Lisle Station Park. He is an active member of the American Association for State and Local History (AASLH) and the National Council on Public History (NCPH) where he serves on their respective new and emerging professional committees. In 2014, Failing was recognized by the Association of Midwest Museums with their Promising Leadership Award. Monday, May 9, 2016 at 9:00 AM The Aurora Fire Department will commemorate the 87th Anniversary of the tragic fire at the Orpheum Building located (Galena & Water St) in downtown Aurora with a special Wreath Laying Ceremony. Each year, the Aurora Fire Department hosts a ceremony in their honor. The public is invited to attend. On May 9th, 1929 The Aurora Fire Department suffered its first “line of duty” firefighter fatality. Captain Barney Weiler of Fire Company 4 was tragically killed while fighting a fire at the Orpheum Building located then on the block of 79-93 Main St. which is now known as Galena Blvd. A plaque dedicated to honor Captain Weiler has been placed at the locations to let us not forget his last alarm. You are currently browsing the Aurora Regional Chamber of Commerce blog archives for April, 2016.